-Morgan's site is an excellent source of info. Focused on the FJ-55. - Awesome site, New TLC FAQ ETC. -Brian puts some great information together on this site. Jeff Zepp's Cruiser Page -Great Restoration step by step procedures with pics. Jill and Neil's Cruiser Restoration Page - Great write up on instrument light fix and good general restoration ideas. - Garie's personal LC dedicated Web site. Garie is a nice guy and knows a lot about Cruisers. A great no holds barred get to the point source of info. Message boards and product reviews. Crushers Rule- Another Cruiser Restoration Page, talks about both fiberglass and Aluminum. AngryPeppers.com - Chris is a great guys and has a great site, 40, 60, and 80. - Jim puts together some great pics and fascinating stories about his cruiser adventure. Toyota Links.com - Not enough links here? Check this out. More Toyota links - More?! - Another great information resource. Tech Manuals etc. Coolerman! - Great tech write ups! Alatao - Custom Fab work for Toyotas (Sliders, Bumpers, Engine swaps, etc) Talk to Oleg! Chimney Canyon 4x4- Talk to Charlie, he's the man. Great Parts and full service shop. VintageOffRoad.com - Looking for a quality cruiser and 100% financing too, this is the place. Cruiser Solutions - A Very Well put together site with products that cant be found in most other places. Great info on Alum. Tubs too. Four Low - Cruiser kitch! TPI 4x4 Parts, and lots of them. Friendly service. JT Outfitters- Like the name! Great source of Parts. Mark's Off-Road - Cool parts, nice guy. Downey Off-Road - Great new site, lots of parts fair prices. Redline Motive - A nice source of OEM parts for decent prices. Also sells many other make and model parts. Classic Cruisers- A Cruiser Restoration place as well as a place to find quite a few Used parts and conversion systems. Restored FJ-40 - These guys do some nice work! 4x4 Connection- Used to be Land Cruiser Connection. Good source for parts. A well put together site. 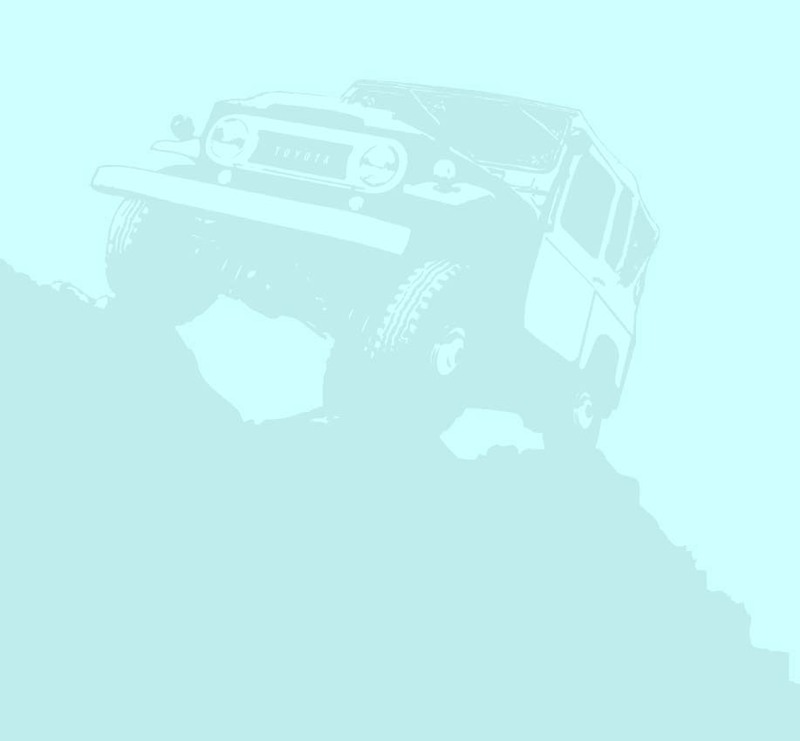 Landcruiser Trader - Newer to the scene, they have a classified section, BB and also used parts for sale. Motorpower.net - Source for Landcruiser 2F engine specs and complete rebuild kits. Rockymountaincruisers.com - Various parts and whole cruisers can be found here. They can also procure steel tubs for you. Landcruiserstuff.com - Lots of used parts available. Toy Cruiser.com - Lots of new and Used parts. Mudrak's Custom Cruiser - A couple of Custom made products can be found here. Longfields -Never break a Birfield again. Premium Forklifts.com - Will rebuild your 2F engine. Good prices! Rising Sun Engines - Looking for a Japanese engine? Matkinsextreme - NEW Land Cruiser Frames!! FoxFab - Ooooh FJ-25 stuff, Nice! AAI- 5985 Lamar, Denver CO 303-422-3751 Custom makes brake lines. Good prices, just tell them what you need. Toyota Land Cruiser Tribute! A MUST SEE! Warn - Winches, hubs etc. Interco Tires - Super Swampers! Certifit - Fenders for cheap! http://www.sillacooling.com/radiators.htm Good radiators, 4 core for your 40.
www.radiators.com - Just like the name says. And they are at great deals too! Other interesting Links Related to Landcruisers, 4x4 and Off-roading..
WWW.MAXIMOG.COM Wow, wish I were rich and bored...this would be the cure! Broken links: Anyone have any info about the below? Back Country Criuisers.com - Great place to buy Fiberglass. It's a Cruiser - Great Step by Step Restoration Photos of Matt's FJ-40. Classic FJ-40 Cruiser Pics - From back when they were still available for purchase. www.crusherworld - A general info site with classifieds. Wardens Auto Repair- A small amount of Cruiser Parts, Great Service, Great Prices, and Some Custom Parts, also does service.